It’s officially spring in Minnesota! And when the sun is shining and the snow is turning to slush underfoot, it’s easy to see summer on the horizon. In fact, many kids are already counting the days to summer break—many, but not all. For the 1 in 8 Minnesota kids who experience hunger, summer is a precarious time, and not necessarily something to look forward to. Why? It means that the meals they rely on having at school will go away. To fill the meal gap that summer creates, Second Harvest Heartland works with school districts, food shelves and community partners to implement, support and help expand programs that bring meals to kids June through August. A $20,000 grant from the Joy in Childhood Foundation (previously The Dunkin’ Donuts & Baskin-Robbins Community Foundation) will help us help even more kids experiencing hunger, this spring and summer and beyond. The main goal of the grant funding is to provide greater access to nutritious food for children facing hunger and support the expansion and innovation of child hunger programs. 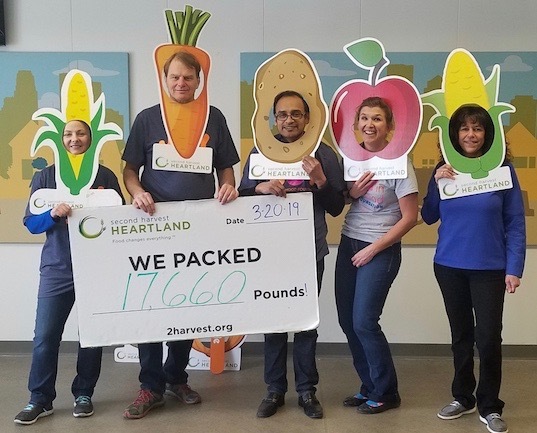 Dunkin’ employees and franchisees recently visited Second Harvest Heartland’s new Brooklyn Park hunger-relief campus to present the check and participate in a day of service. The grant is part of the Joy in Childhood Foundation’s three-year, $1.5 million commitment to Feeding America hunger-relief organizations and food banks in support of children experiencing hunger. You can help ensure that all Minnesota kids have the nourishment they need to succeed in school and in life. Donate today.